Overall 2018 has generally been a good year for It’s A Knockout weather. However, come September time, it did turn a little for the worse. This brings us to a question often asked of us… “What happens to a It’s A Knockout in the rain?” Well, to be honest, the answer is, it carries on regardless. Sometimes, we prefer it ! You’re going to get wet on the games anyway, so what’s the difference? 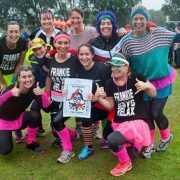 The pictures shown here in this blog were taken at a Cornwall Hospice Care fundraising It’s A Knockout day in Truro in September 2018. You’ll see that everyone had a great time. 33 teams turned up (only 3 dropped out last minute) all raising money for the charity. Our wet games and inflatables are going to get wet anyway no matter what the weather happens to be on the day, in fact when it’s raining it saves us a job of throwing water on them as Mother Nature is doing it for us. So rain is definitely not a problem. Our watch points though are making sure areas do not become muddy and of course the wind. But, these are “watch points” for normal days anyway. Just get the teams to bring a team gazebo with them and this can act as a base to keep their things dry whilst they are having fun on the games. 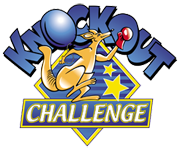 To read more about how a charity can raise money using one of our It’s A Knockout’s please see our Charities page and also our Charity FAQ’s blog. If you’d like more information about the Cornwall Hospice Care charity and their work, please go to their Facebook Page or visit their website Cornwall Hospice Care.